RPGSeek.com is live! Four human-moderated search engines indexing 500+ sites, all dedicated to role-playing games and ready for use. I personally visited every site and verified it is active and useful to a role-playing gamer. The four search engines cover 4th Edition Dungeons and Dragons, role-playing blogs, role-playing game publisher home pages and a final engine that combines all of the above, plus any other relevant sites that do not fit into the other search engines. RPG Publishers: Official home pages of role-playing game publishers only. No fan sites, blogs or Wikipedia! Note: wizards.com is not included in this engine. They have so much keyword “mojo” on Google they distort the results. Wizards.com is in the “4th Edition” search engine. 4th Edition Dungeons and Dragons: Sites related to the current release of this venerable game. Utility software, quality fan sites and wizards.com comprise this category. Everything Role-Playing: All of the engines above and any other quality role-playing sites. A catch-all search engine for a broad-based search. FYI, once you complete a search, you can just click on the radio buttons and the system will automatically pull up the results for new selection. The main problem with most custom search engines is that they are difficult to maintain. There needs to be a method to add new sites to the index and manage the existing index of sites. To that end, I added a link directory to RPGSeek.com. The link directory has a complete submission system for sites and categories, as well as an automated way of checking that a site is still active. When you submit a link to the directory, I verify the site is RPG related, approve it for the directory and add it to the appropriate search engine. It also allows users to browse the links indexed in each search engine. 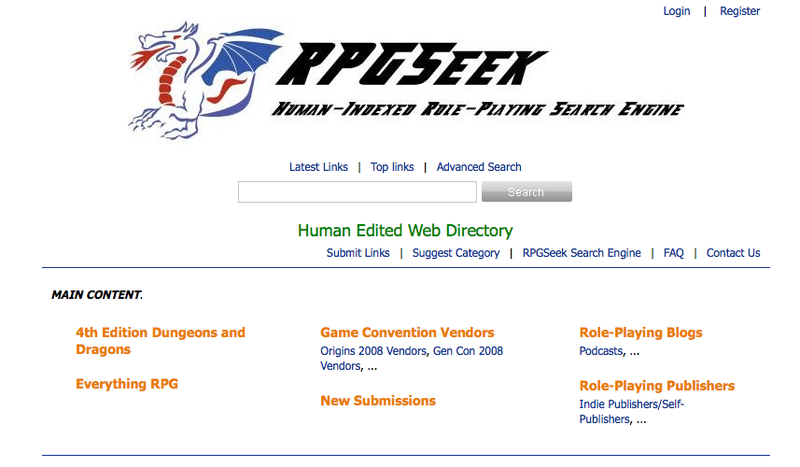 I also added the list of “Gen Con 2008” and “Origins 2008” vendor links to the RPGSeek.com directory. The response to the vendor lists was amazing and I will compile them again for this year’s conventions. RPGSeek.com is free to use and there is no fee to be listed in the directory. I am doing this strictly to make it easier to find quality role-playing content on the internet. However, I cannot do it alone. If you find a great site that the role-playing community needs to know about, please submit it to the directory. Registration is not required to submit sites and categories! Even more critical, if RPGSeek.com provides results that lead to a dead web site, please email us with the “Contact Us” form or your can use our direct email, visible after you follow the link below. Continual feedback from you, the role-playing community is the only way RPGSeek.com can succeed. If you would like further information, please read the site FAQ or drop us a line with the contact us page. I do ask a small favor. If you like the site and find it useful, please submit RPGSeek.com to your favorite social networking site (digg/Furl/Slashdot/Mixx/Facebook etc. There is a button on the front page to do so). The more people that use the site, the better the index will become! ← Are You Buying Fewer Games in this Bad Economy? Very cool! I guess I know where I’ll be surfing through tonight. Finally a search engine for PnP RPG’s!!!!!!!!!!! Question: if a site fits into more than one category, should we submit it twice? For example, my site has a couple of generators specifically for 4e, but a lot of gens that are good for any system. I submitted it as ‘everything RPG,’ but I’m wondering if I should also resubmit it as 4e. Yes, you can submit to multiple categories. Although, if the content (in this example some 4E tools) is on a specific page, please only submit that link. If the entire site fits in two categories, by all means submit it to both!